What better way to celebrate Spring and the Easter season than with some adorable chicks! Each is handcrafted from paper clay and embellished for a truly unique piece. 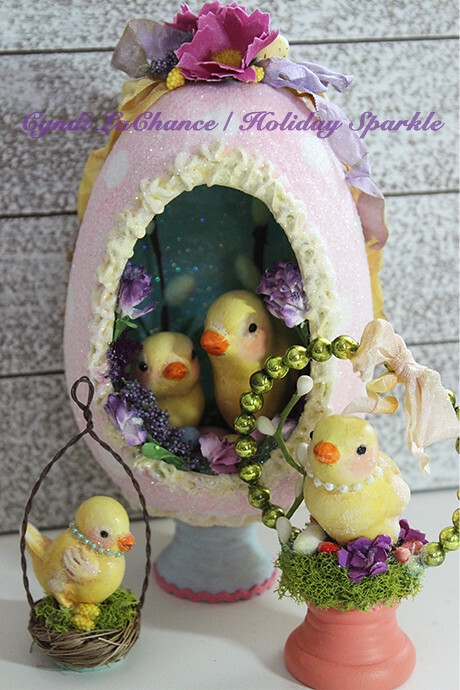 Reminiscent of those magical Easter sugar-candy dioramas, this piece has all that charm and more. 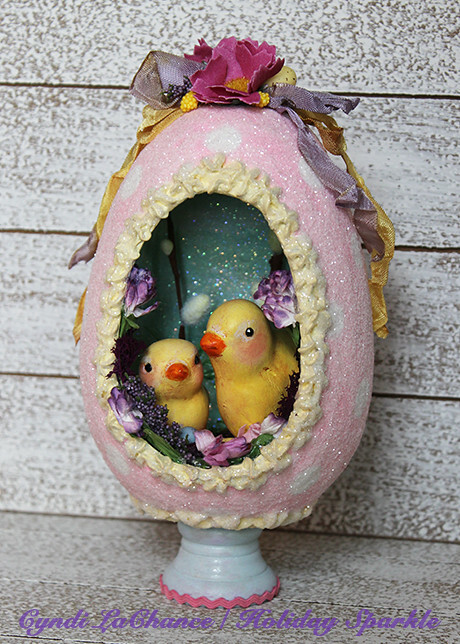 Two paper clay chicks sit inside their cozy egg surrounded by faux paper flowers and faux cat tails. The inside is painted blue shades and covered in an iridescent glitter that catches the light. The paper mache egg has clay “frosting” around the opening and base. Glitter “sugar” covers the entire egg along with accent flowers and hand aged/dyed ribbon at the top. The pail blue wooden base positions it up for everyone to see. "Love Bird Ornament" is an original, one-of-a kind design. Price is $54.00 and INCLUDES shipping in the continental U.S. SOLD! Rosemary elegantly sits waiting for her day to begin. Dressed in her best pearls, she has black beads for eyes and hints of glitter to catch that morning sun sparkle. The base is wooden. Her arch is made of vintage green glass beads which have a wonderful aged patina. A hand dyed ribbon, paper flowers and moss round out this wonderful treasure. Perfect for your entire Spring season. Overall size: 3” wide x 4¼” tall. Price is $28.00 and includes shipping within the Continental US. SOLD! 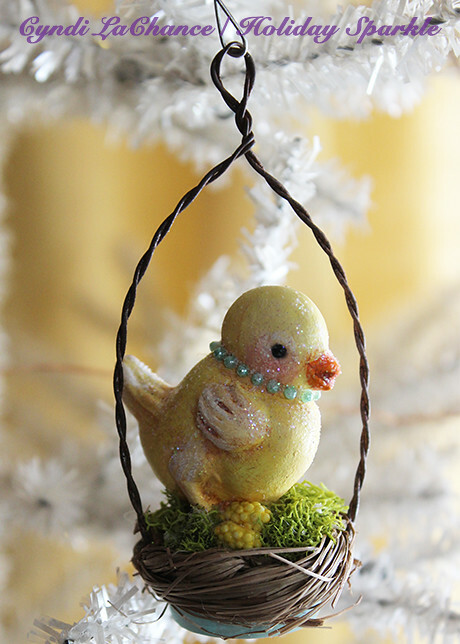 This baby chick in his nest will work perfectly with any tinsel tree you may display for Easter. Hand-made of paper clay with black beads for eyes and a wonderful blue rhinestone “necklace”. 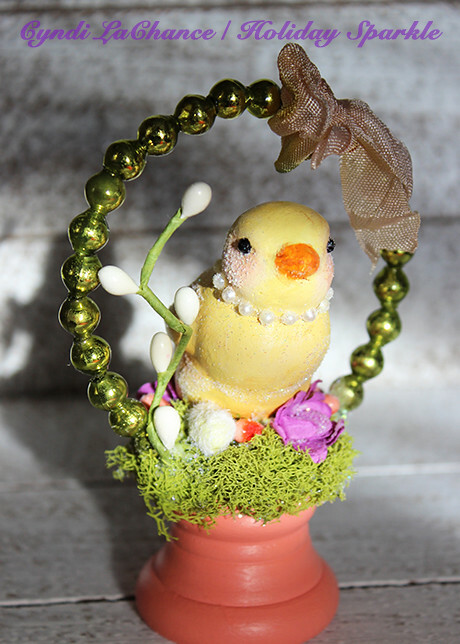 A hand twisted rusty wire creates the hanger for you chick, but a wooden base is attached should you prefer it sit on a table along with your other Easter décor. She is just the perfect touch of elegance for you special spring tabletop tree. Overall size: Chick is small – about 1½” tall. Price is $20.00 and includes shipping within the Continental US SOLD!